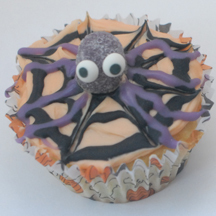 Not all spider cupcakes have to have black spiders. Purple ones are great for Halloween, too, or any occasion. What You Need: 1 cupcake, orange frosting (we just used Pillsbury’s Halloween frosting already tinted); purple gumdrop; purple and black gel icing in tube (we used CakeMate); 2 candy eyes (optional); toothpick. How to Make It: Frost cupcake. Use black gel in tube to “draw” three circles, one inside the other. Drag toothpick through gel, starting at the center, at several points to form web. (Wipe toothpick clean in between). Squish gumdrop a bit to make it flatter. Use gel to attach eyes and place in center of web. Use purple gel to draw legs. This entry was posted on Wednesday, September 24th, 2008 at 6:28 pm	and is filed under bug and spider cupcakes, Halloween cupcakes. You can follow any responses to this entry through the RSS 2.0 feed. Responses are currently closed, but you can trackback from your own site.